The Canadian Opera Company’s new production of Falstaff is a delight from beginning to end. Famed Canadian baritone Gerard Finley, long resident in Britain, returns to the COC for the first time in 20 years to sing the title role in Verdi’s great opera. Not only that, but in a wonderful display of home-grown excellence, the entire cast is Canadian. And to top it all off, the production, directed by renowned Canadian director Robert Carsen, is both gorgeous and witty in its own right. This may be only the first opera of the season but it is definitely one not to miss. Falstaff was Verdi’s final opera, first produced in 1893 when the composer was nearing his 80th birthday. His librettist Arigo Boito, a composer in his own right, based his libretto on Shakespeare’s comedy The Merry Wives of Windsor, first performed sometime prior to 1597 along with parts of Shakespeare’s history plays Henry IV, Parts 1 and 2. Legend has it that Queen Elizabeth I requested that she wished Shakespeare to write a play about “Falstaff in love” and Merry Wives was the result. In doing so Shakespeare transported a character who would have died sometime before 1415 and placed him Elizabeth’s own day. Similarly, in the new COC production – a co-production with the Royal Opera House Covent Garden, Teatro alla Scala, Metropolitan Opera and Dutch National Opera – Robert Carsen and his design team have relocated the action from the first Elizabethan era to the beginning of the second, i.e. sometime during the 1950s. The transposition works very well and adds to the humour by emphasizing the ethics of a period where people a least paid lip service to maintaining strict moral codes. Paul Steinberg’s set design changes Falstaff’s hangout, the Garter Inn, into a grand oak-panelled hotel. When the opera opens, Falstaff’s gluttony is made comically obvious by the presence of at least a dozen soiled room service tables littering his room where his cohorts, Bardolfo and Pistola, are hiding. Carsen and Steinberg relocate the second scene of Act 2 from a generic garden to the lavish hotel dining room where Mistress Quickly, Alice and Nanette Ford and Meg Page are having a ladies’ lunch stage right. While a team of extras keep the huge room realistically busy, Ford, Dr. Caius, Bardolfo and Pistola enter to have their own business lunch stage left. No reason is given in the opera why Ford prefers Dr. Caius to Fenton as a match for his daughter Nannetta, except that Caius is presumably rich and Fenton is not. To illustrate this, Carson has the brilliant idea of showing us the income disparity between the two by making Fenton a waiter in the dining room. 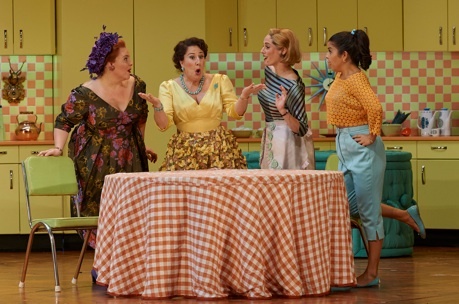 The set audiences will enjoy as much as the hotel dining room, is Alice Ford’s enormous 1950s-style kitchen, all in pastels, with a dinette set and accoutrements that are all period-perfect. It is, of course, unrealistic to have a kitchen as wide as the stage, but that is necessary for all the action that occurs there. This is because Carsen stages the most chaotic, mess-making search for Falstaff in Ford’s house that I have ever seen. Not only does Ford empty out all the dirty linen from the powder blue laundry hamper where Falstaff later hides, but the chorus of men Ford brings with him empty out the contents of the myriad cupboards of the kitchen onto the clothing. It’s a gleeful reversion of order into disorder. The prime difficulty of using such massive, detailed sets is that it takes rather too much time to change them. On the whole it seemed that the annoyance of waiting for the set to be changed was immediately dissipated by the pleasure of seeing the new scene. This difficulty occurs only before intermission which comprises the four scenes of Verdi’s Acts 1 and 2. After intermission, the problem is avoided by a smooth transition from the “piazzale” near the Garter Inn, reconceived as a stable, to Windsor Great Park, where the meeting place of Herne’s Oak is reimagined as the oaken walls outside the hotel. Carsen does not do away with the iconic image of the Shakespeare’s play of Falstaff dressed as Herne the Hunter wearing a huge headdress of stag’s antlers. What he does change is to have costume designer Brigitte Reiffenstuel dress all the “fairies” who attack Falstaff, except Nannetta, also as Herne the Hunter. While one misses the fun of home-made fairy costumes that this scene can provide, Carsen is clearly thinking of what happens during this scene, where not only Falstaff is made a fool but so is Ford. Carsen thus makes the scene look forward to the concluding chorus of the opera: “Tutto nel mondo é burla. / L'uom é nato burlone” (“Everything in the world is a hoax. Man is born a fool”). Inhabiting Steinberg’s beautiful sets and filling out Reiffenstuel’s delightfully evocative 1950s costumes is a remarkable all-Canadian cast. You may not think yourself especially patriotic but to see Canadians as the ten soloists standing across the stage, all of whom do excellent work, is a sight to make any Canadian proud of the artists this country has produced. One could hardly ask for a better group of singers than Gerald Finley as Falstaff, Colin Ainsworth as Bardolfo, Robert Gleadow as Pistola, Michael Colvin as Dr. Caius, Russell Braun as Ford, Lyne Fortin as Alice Ford, Lauren Segal as Meg Page, Frédéric Antoun as Fenton, Simone Osborne as Nannetta and Marie-Nicole Lemieux as Mistress Quickly. Finley has a a beautiful baritone voice – warm, deep, rounded and full. His special virtue is the absolute clarity of his diction and his attention to nuance with every word. In Falstaff’s great Act 1 aria “L’Onore!”, Finley increases the comedy by repeating each “non” of Falstaff with exactly the same emphasis and tone. This attention to the text is also a sign of a great actor and Finley is marvellous as Falstaff. Trim and fit in real life, Finley treats the fat suit he wears and the prothetic double chin as extensions of Falstaff’s personality. Indeed, when Falstaff sings of his girth, “Quest'é il mio regno. Lo ingrandirï” (“This is my kingdom. I mean to increase it.”), Finley makes us fully believe in Falstaff’s vanity. His comic timing is wonderful, especially in Falstaff’s scene with Mistress Quickly and in the laundry hamper scene. We have to hope that singing with the COC will prove a positive enough experience that Finley will visit us more frequently. Among the women, Lyne Fortin and Marie-Nicole Lemieux are especially good. Lemieux makes Quickly’s seduction of Falstaff in his gentlemen’s club absolutely hilarious, knowingly using the sexual allure of a middle-aged woman to draw Falstaff into the plot of Alice Ford and Meg Page against him. Lyne Fortin, renowned in Quebec but surprisingly making her COC debut, is in excellent form vocally and dramatically as the wily Alice Ford, ready to make fools of the two men in her life – her husband and Falstaff. Of the men, Russell Braun is as dependable as always. He is especially funny in his disguise as Fontana, here depicted as a rich Texan, attempting to lure Falstaff into a trap, yet privately infuriated with his success. Both Colin Ainsworth and Frédéric Antoun have sung lead roles with Opera Atelier, so it is luxury casting to have them in secondary roles here. Antoun’s ardent, Italianate tenor is perfect for the lovesick Fenton, while Ainsworth’s high, pure tenor and nimble acting is well paired with Robert Gleadow’s agile bass as Falstaff’s two thieving cronies, Bardolfo and Pistola, who can’t keep their sticky fingers away from silver of any kind. This is the most deeply satisfying production of Falstaff I have ever seen. Carsen makes the connection between Falstaff’s gluttony, vanity and his sexual desires perfectly clear. He sees Falstaff as exactly the comic personification of vice that Shakespeare does when he has Prince Hal address him as “Thou globe of sinful continents” in Henry IV, Part 2. At the same time Carsen knows that the story is headed toward the revelation that not just Falstaff is a fool, but so is Ford and, indeed, so is everyone – an insight that gives the farcical action its depth. Johannes Debus conducts the COC Orchestra with great sensitivity and doesn’t miss any of Verdi’s musical humour or allusions to Elizabethan dance. Falstaff makes a great opening to the COC’s new season and introduces us to a co-production that we will be happy to see again – one hopes with another all-Canadian cast. Photos: Colin Ainsworth, Robert Gleadow and Gerald Finley;Marie-Nicole Lemieux, Lyne Fortin, Lauren Segal and Simone Osborne. ©2014 Michael Cooper.